It is claimed that this very unusual surname is of Dutch origins, and this may well be true. However it has been recorded in England from at least the 16th century, see the first recording below. It is probably a variant of the Old German 'Havecost' translating as 'the place of the hawk'. German and Dutch are very close as languages, although the pronunciation is quite different. The English surname 'Havoc' also derives from the German, (Anglo-Saxon) and has the same meaning. The spelling form in England as 'Havvock' is very rare, and as to whether it derives from the Dutch-German 'Havik' or the English-German 'Havoc', is far from clear. It is known that from the 17th to the 19th centuries Dutch engineers were employed in many parts of England (and Ireland) to drain the fens of East Anglia, the wetlands of Somerset and Devon, and the midlands of Ireland and the North. Many stayed, their names being (usually) anglicized to 'sounds like' forms, and it is quite probable that 'Havvock' is one of these names. 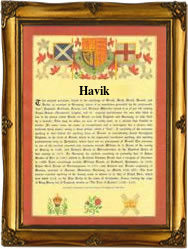 Examples of the surname include (in Holland) Dirk Havik who married Lijsbeth Gerrits at Berverwijk, Noord Holland, on May 21st 1684, and Willem Havik, recorded at Haarlem, Holland on August 24th 1721. In England recordings are rare but an interesting one is that of Margaret Havock who married William Craddock at Blakeney, Gloucestershire, on June 11th 1726. The first recorded spelling of the family name is shown to be that of Peter Havicke, which was dated May 31st 1573, a witness at St Botolphs without Aldergate, London, during the reign of Queen Elizabeth 1, known as 'Good Queen Bess' 1558 - 1603. Surnames became necessary when governments introduced personal taxation. In England this was known as Poll Tax. Throughout the centuries, surnames in every country have continued to "develop" often leading to astonishing variants of the original spelling.